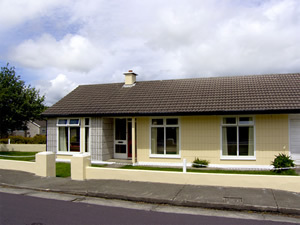 This comfortable bungalow is only 10 minutes walk from Skibbereen town centre and less than a 90 minutes drive from Cork City. The lounge is bright and airy with a welcoming open fire and the rear garden is enclosed. It is within walking distance of all amenities including a lovely riverside walk. Exploring West Cork could not be easier, with picturesque coastal villages - Baltimore, Glandore, Union Hall, the renowned nature reserve of Lough Hyne, boat trips from Baltimore to several islands and Skibbereen's Heritage Centre providing lots to do.Shop. Pub 880 yards. Beach 5 miles. GF: lounge, kitchen, 2 doubles, single with ensuite shower room, bathroom with shower over bath.Electricity and oil central heating included, open fire with starter pack, linen and towels included, No Smoking, travel cot, high chair, TV, dvd player, CD, freezer, microwave, dishwasher, w/machine, internet access, hairdryer, fully enclosed garden, patio area, garden furniture, private off road parking. Sorry no pets.